Almost 19 years at the club, Arsene Wenger is the currently the longest serving active manager in English football and you don’t get to last for that long without evolving over time. Success may have been sparse in the past hand full of years but what Wenger has achieved in terms of sustenance is remarkable. Rishad Bharucha tells us more. Arsenal fans across the world have been largely split into two camps in recent seasons. The first camp houses those in favour of seeing Arsene Wenger remain at the helm and lead the club to the success they can now reap with finances now available for spending on marquee signings. The second would prefer to bid the Frenchman au revoir after nineteen years at the club. Both camps would most likely agree that throughout his nineteen year tenure, Arsene Wenger has delighted football fans across England and Europe with an aesthetically pleasing brand of football. 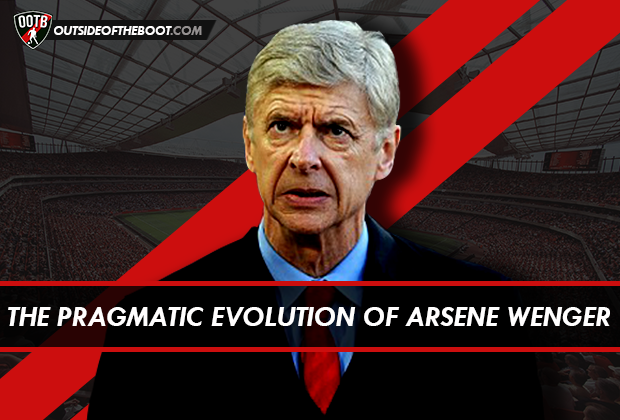 Football is a game of two halves, and the same can be said about Wenger’s time at the club. In his first nine years, he provided Arsenal fans with fond memories of an unbeaten season, trophies and a brand of quick, incisive, attacking football. For the last ten years, some would argue, he has potentially increased the Arsenal fans’ risk of cardiac arrest during games, won one trophy, while still playing attractive football at a varying intensity. Multiple factors contributed to this transition from a team that sent chills down opposing spines as they set foot on the Highbury turf, to a team that was no longer feared, but still played attractive football in one of England’s finest new stadiums. The move from Highbury tightened Wenger’s purse strings and forced him to develop a young team of relative unknowns that consistently finished in the Champions League positions in the Premier League. The nature of his signings changed, as he sought more technically proficient players, often sacrificing a balance with physicality. Arsenal fans realized that this was detrimental to their chances of challenging for domestic and European honours, often citing the common waters between Patrick Vieira’s swan song and Arsenal’s last trophy. Despite these clamours, Arsenal came close to winning trophies on multiple occasions in the last ten years through appearances in a Champions League final, a Carling Cup final and a couple of League title chasing campaigns that faltered at various crucial moments. Fast forward to the present day and Arsenal have reached another FA Cup final at Wembley. They are also waiting to capitalize on any slip ups by League leaders Chelsea as they try to close the gap on the top spot. After consistent finishes in the third and fourth spots in the League, why are Arsenal surprising people with a late challenge for the title and giving themselves a convincing case to take the runners up spot? The core of the 2007-08 Arsenal team that came close to winning the title but for a series of unfortunate events that unfurled against Birmingham City, included but was not limited to Cesc Fabregas, Alexander Hleb, Tomáš Rosický and Mathieu Flamini. The only notable English player who rose to the fore during that period was a young Theo Walcott signed from Southampton two seasons prior. The summer transfer window of 2015 saw the arrival of Danny Welbeck bolster an existing English core of Jack Wilshere, Theo Walcott, Calum Chambers, Kieran Gibbs and Alex Oxlade-Chamberlain. While neither of these six Englishmen are guaranteed a starting position at the club, their presence and involvement gives Roy Hodgson options for England selection. This is a marked change in Wenger’s youth policy in recent seasons compared to the times when he claimed that English players were too expensive. Arsenal’s defensive record in 2012 was not exactly ideal for challenging for the League title with more than half the goals conceded coming from set pieces. While some might argue that the numbers from this season look better, the general feeling amongst Arsenal fans who travel to games suggests that Arsenal are no longer as consistent at causing late-game heart attacks as they used to be (your cardiac response may vary on this one). Having one of the most capped German defenders and an underrated pacy Frenchman play at the heart of the defense combined with Steve Bould’s appointment as assistant manager in 2012 certainly contributed to some added defensive stability in open play and set pieces. Arsenal fans might still believe that Wenger prioritizes youth over experience no matter what, but the recent axing of Wojciech Szczęsny and the quiet rise of David Ospina suggests that the Frenchman has become more pragmatic in his player selection. In the last few seasons when Arsenal were considerably restricted by their finances, Wenger often dropped a sound bite in his press conferences that sometimes signing an experienced player would “kill” the development of a younger player in the squad. Fortunately, Arsenal fans no longer have to worry about accusing the manager of being naive in this sense, as a balance across the different positions in the squad, similar to the time of the Invincibles, seems to have been restored. Wenger has gone from signing Eduardo and Arshavin from the relative unknown, to the bringing in Mesut Özil and Alexis Sánchez from two Spanish giants. The signings of Özil and Sánchez have certainly given Arsenal fans the belief that the purse strings have finally loosened at Arsenal after a period at the club that might forgettable in terms of honours won, but will hopefully be revered one day as a managerial achievement. No team in the world is guaranteed success and sometimes as fans we take this success for granted. Few managers in the game today are blessed with the kind of stable backing Wenger has from the Arsenal board, and the Frenchman has rewarded that faith with eighteen consecutive seasons in the Champions League, that not only allow the club to lock horns with Europe’s elite, but also allow the club to pay off the debt on the Emirates Stadium. While there is certainly a split in the Arsenal fan camp about whether or not Wenger is the right man to take the club forward and spend the money now available to him, it certainly looks like he will honour his contract at the club. Arsenal’s deal with PUMA also suggests that the club moving forward on the road to becoming a financial superpower in Europe if they cannot be considered one already. It is unlikely that this additional money will affect the ticket prices, but it seems like Arsenal fans can look forward to more big signings over the next few years with the club’s new financial muscle. For a long time, Arsenal fans dreaded the summer and the onset of ‘silly season’ as the rumours abounded linking their best players away from the club. Cesc Fabregas, Samir Nasri and Robin van Persie were arguably three of the biggest assets prised away from the club at a time when Wenger developed and depended on them for the success of the team. While fans will argue that Wenger’s youth project has been a failure, one cannot help but wonder if additional patience on the part of these players coupled with one or two more signings would have propelled Arsenal to a trophy long before last season’s FA Cup success. Football pundits often sang a familiar song about Arsenal being “one or two top-level players away from winning a trophy”. Wenger undoubtedly knew the tune but it’s difficult to come to conclusions about the exact details that may have derailed any potential signings at that time. A peek at the Arsenal squad now would suggest that there is strength in depth to back up their quality as well, something that might seem very surprising three or four seasons ago. At present there is in fact an excess of quality available, so much so that experienced internationals like Lukas Podolski and Joel Campbell have had to go out on loan to get more playing time. Even with Arsenal fans crying out for the signing of a defensive midfielder, there are three players in the squad at the moment capable of playing that position in Mikel Arteta, Mathieu Flamini and arguably one of the first names on the team sheet at this time, Francis Coquelin. The signing of Gabriel Paulista from Villarreal in January has also added cover in a position that over the last few seasons has been the scourge of Arsenal’s title challenge. Even the most devout fan of the Frenchman will attest that Wenger is often very stubborn in his beliefs. The latest chapter in this pragmatic evolution, and arguably the biggest surprise, has been Wenger’s pragmatic approach in the big games this season. The Arsenal performance against Manchester City surprised most of the pundits and the result at Old Trafford in the FA Cup proved that Arsenal were no longer likely to be pushed over by Manchester’s giants. While it remains to be seen whether Wenger can finally lift the curse of Mourinho and beat Chelsea at the Emirates Stadium in under a week’s time, the Frenchman will have a significantly larger squad of players to choose from in a bid to place a small but potentially harmful dent in Chelsea’s title charge. Regardless of the result, Arsenal will have made progress if they finish 2nd or 3rd and win the FA Cup this season. When results against big teams have often affected their points tally, this season can be considered a marked improvement, and a step in the right direction in this regard. Overall, with Arsenal equipped to handle Financial Fair Play off the pitch, and steady improvement being made in terms of success on it, the future looks bright. Or as Arsenal fans will tell you, it’s red and white.